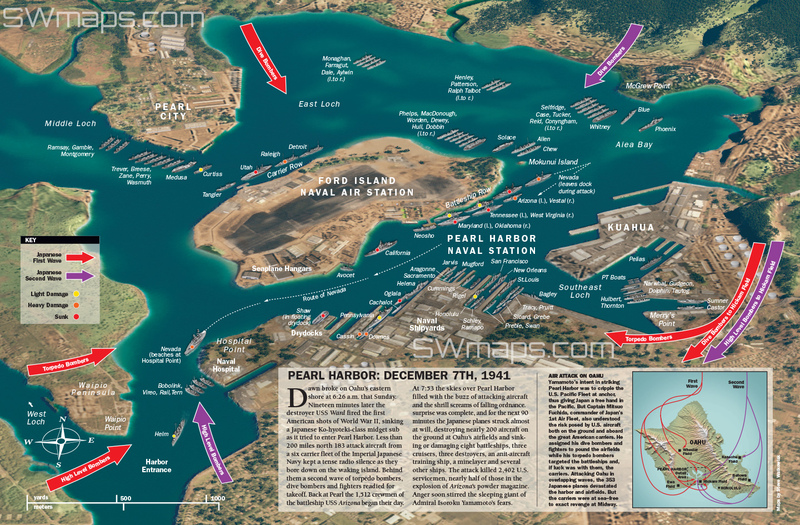 Map of Pearl Harbor, Hawaii, December 7th, 1941 showing position of US ships in harbor. 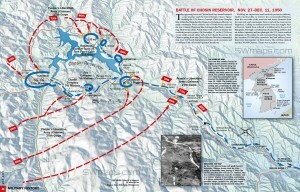 For Military History magazine. 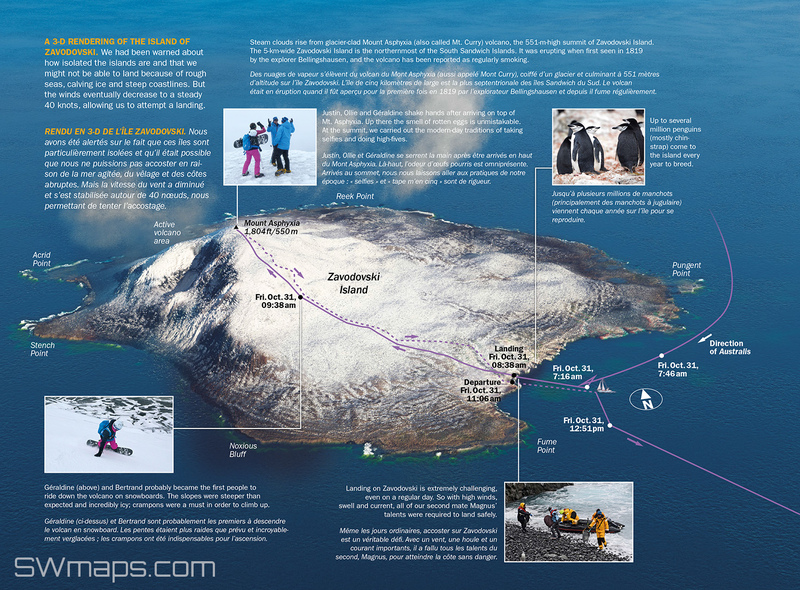 A 3D rendered map of Zavodovski Island, the northern-most island of the South Sandwich Island chain. 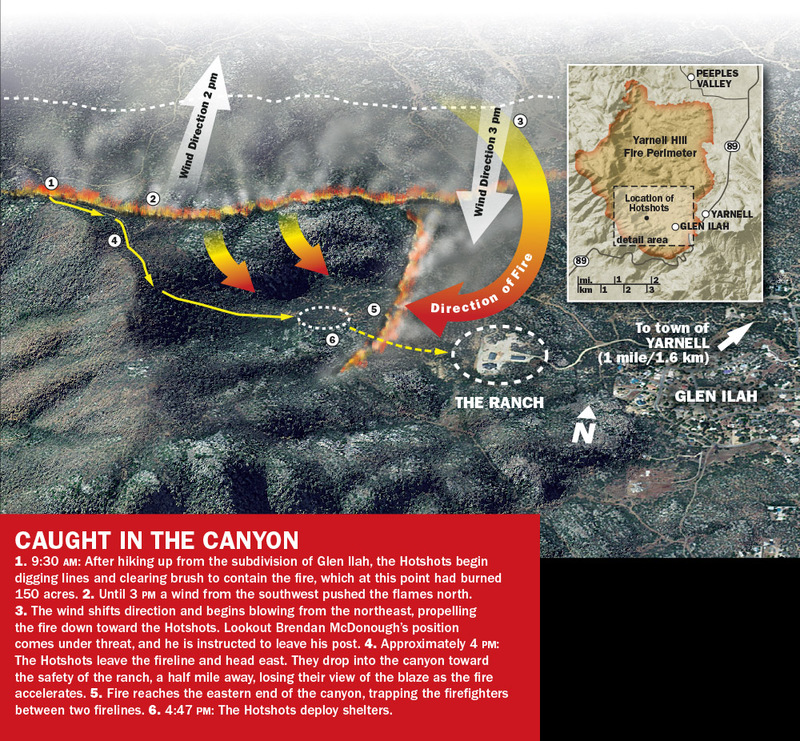 This model was created using a hand-drawn topo map, photographs and satellite images as references. A digital elevation model (DEM) was created by plotting the elevation points, then given natural textures and features using the 3D modeling program Terragen. From the book The Pursuit of Endurance – On The Shoulders of Shackleton. 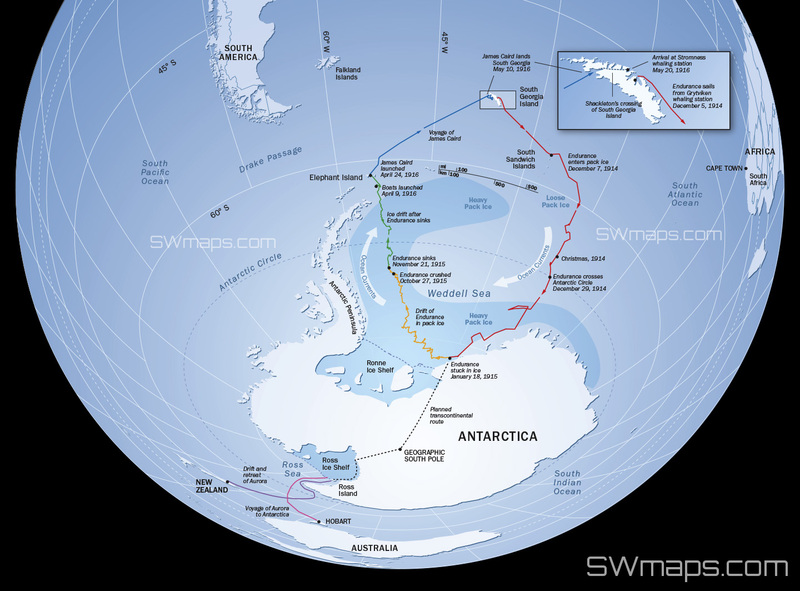 Map showing the route of Ernest Shackleton and his ship Endurance during his attempted expedition to cross Antarctica in 1915. The Endurance became trapped in pack ice and the ship and crew had to endure over one year living on the pack ice before being able to launch lifeboats to Elephant Island then on to South Georgia Island. Produced for the book THE PURSUIT OF ENDURANCE – On The Shoulders of Shackleton, released November 2015. This map, made for the book Surviving Sandy, shows the track or path of Hurricane Sandy starting as a tropical storm in the Caribbean Sea, passing over Jamaica, Cuba, The Bahamas and into the Atlantic Ocean before making landfall new Atlantic City, New Jersey on October 29, 2012. 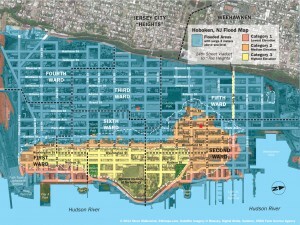 On August 7th Hoboken mayor Dawn Zimmer presented the Hoboken Resiliency and Readiness Plan. 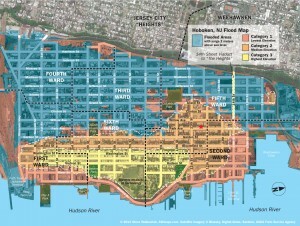 Hoboken Resiliency and Readiness Plan from Hoboken NJ on Vimeo. I created an earlier version of this map by overlaying an old flood map of Hoboken, NJ onto an updated street grid to get a rough idea of where the different elevation zones fell within the city. I wanted to update this map with even more information, so my next step was to work with an existing digital elevation model (DEM) to get an idea of where flooding was most likely to occur at different water levels. I started with the highest resolution data set publicly available, which is 1/9 arc-second (3 meter) NED data from the USGS. I used a program that allows me to set water elevations, so I did a normal, 1 meter, 2 meter and 3 meter modeling of water levels from the baseline DEM. I have no way of knowing exactly what tide level was present when the original DEM was sampled, but I am going to assume an average sea level in the Hudson River and add to that. This modeling isn’t as sophisticated or as accurate as a proper engineering analysis, but gives a rough idea of what is the likely outcome of flooding. I also made an animated GIF of the four different maps so that the progression of water levels can be seen in overlapping steps. The first map is without any rise in tide or surge. This is where the river would be at either high or low tide. 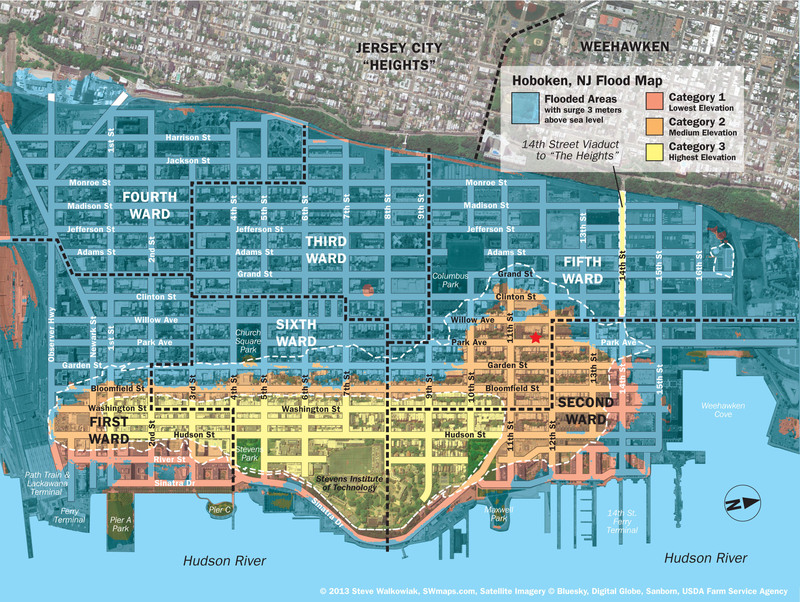 Most of the waterfront and piers are at least several feet above the high tide mark, but changes in ocean levels and future storms will require Hoboken to rethink its waterfront location and building practices. The second map I modeled was with a rise in water level of one meter (about three and a quarter feet). At this level you start to see some of the lowest areas of town receiving water. These are areas that are also prone to flooding even in a heavy rain. Since water will seek the lowest level, the runoff from a heavy rain could easily flood these vulnerable areas. Having lived in different parts of Hoboken over 25 years, I have a lot of anecdotal evidence to this phenomenon. The new wet weather pump station on Observer Highway is supposed to alleviate this problem in the future. 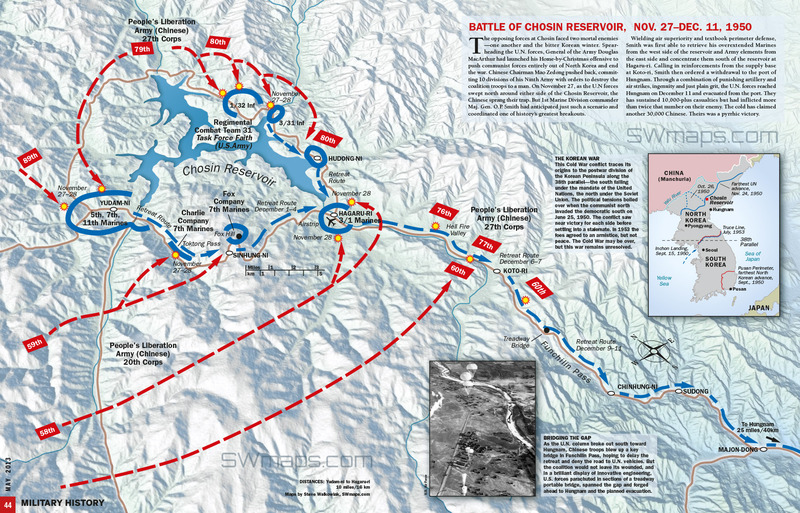 The third map shows a water level increase of an additional meter, to two meters (six and a half feet). You can see how a large area of the city is quickly inundated with just the additional three feet of water. 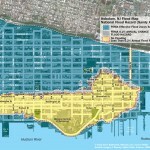 Most of these areas of the city seem relatively level as you walk around, so it is easy to understand how this much water can make a big difference very quickly. Because much of the construction in this city is well over 100 years old, many people still have living space on the ground floors, and in some cases have even expanded living quarters into basement and sub-street level spaces. Newer construction tends to have parking garages on the ground floor, which leaves cars vulnerable to flood damage. 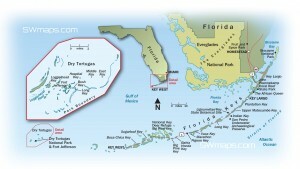 Almost all the buildings in these areas experienced some form of damage in the hurricane. In many cases lobbies and garages had to have repairs made. Many cars that were not moved beforehand were totaled. The water level modeling is now very close to the vintage flood map that I originally used. The blue water areas are now nearly identical to the border between the Category 1 and 2 elevations (the white dotted line between the red and orange areas). 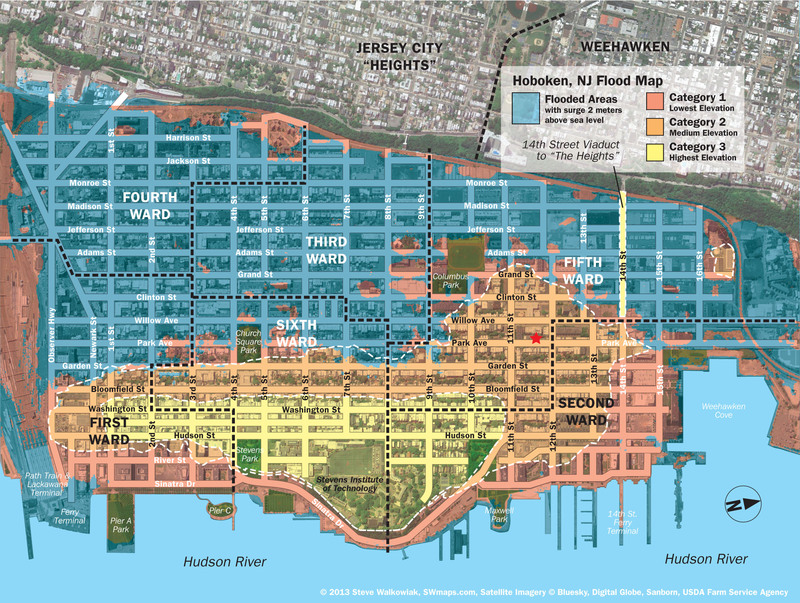 The fact that there is no flooding in the Category 1 areas along the waterfront and in the northeast corner of town is probably due to the fact that the original flood map information predates most of the new construction along the waterfront over the last 10 years. Many of these areas were probably raised slightly from their original pre-construction elevations. The fourth map shows a water level or surge of three meters (about 10 feet) over sea level, which is about what was reported. This is above the normal high tide level– which was experienced twice during the course of the storm, so a total of maybe 14 feet above low tide. 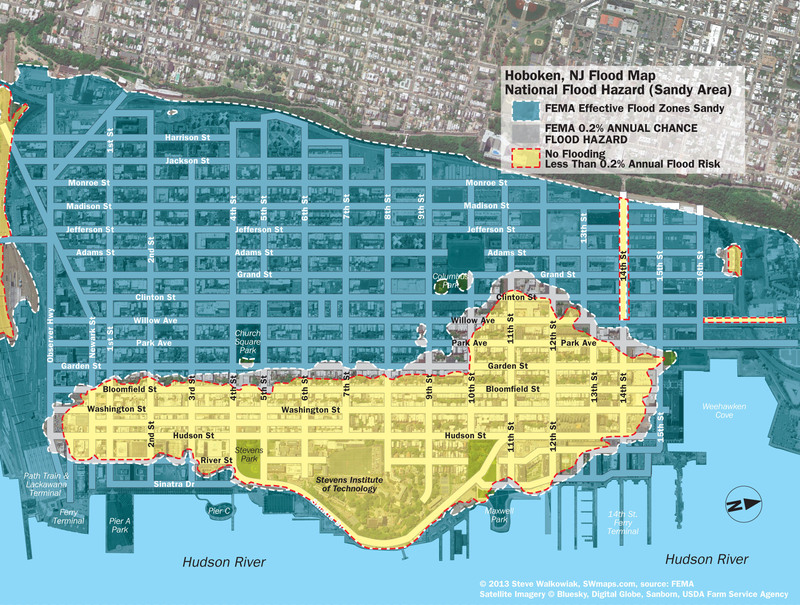 This might come very close to approximating the areas of street-level flooding from Hurricane Sandy, but may be a little higher than what was experienced. The actual level may fall somewhere between the third and fourth maps, close to the border between the Category 1 and 2 elevations. I am basing this mostly on my observations and reporting from that time. I know that the intersection of 12th and Clinton was flooded as shown because my car was parked in a garage near that corner. Since the garage was a half foot or so above street level, the car was not touched, but five blocks away, at the corner of 14th and Jefferson, one of the most iconic photographs of the hurricane was taken. 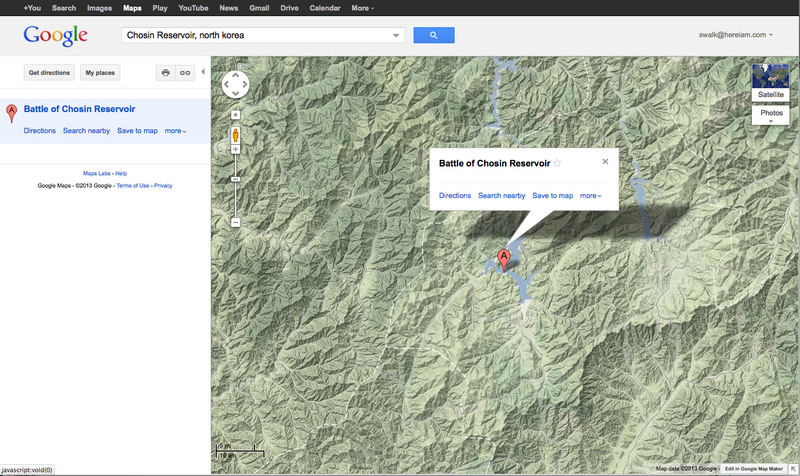 I’m hoping that reporting on the crowdsource map will confirm the actual scope of the flooding. 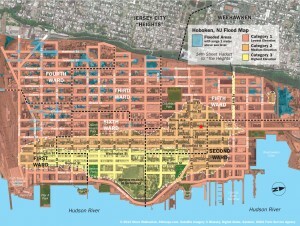 You can see what the original “island” of Hoboken might have once looked like. A lot of the lowest levels of the city had been built up over marshy areas–mostly in the western part of the town–for expansion in the 19th Century. 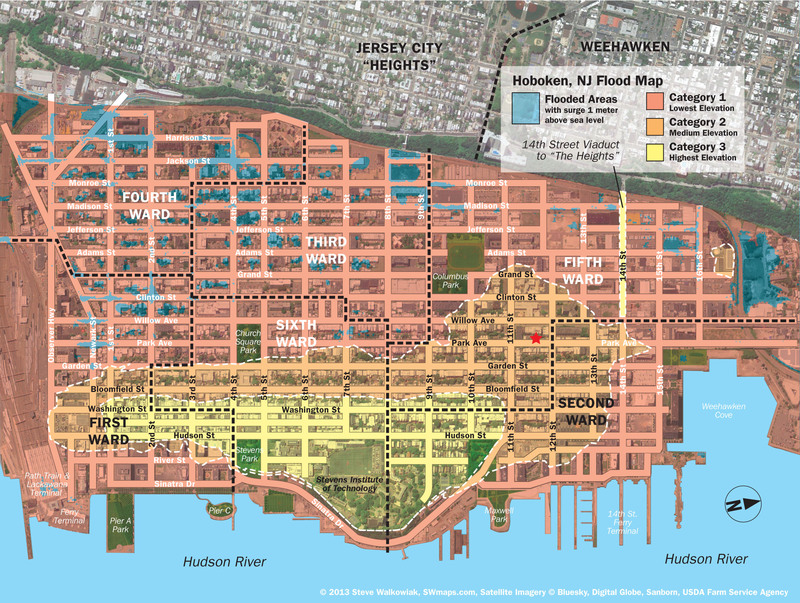 You can also see how easy it might be to protect much of Hoboken in the future since there are only a few vulnerable areas at the north and south parts of town where river water can easily encroach on the lower lying areas. There is a barrier along most of the eastern edge of the town because of this naturally occurring mound of land (that is the lower edge of the map since it is oriented 77 degrees clockwise, with north pointing more toward the right). The other engineering necessity would be preventing backflow through the sewers when the water got above a certain level. FEMA has updated their flood maps post-Sandy and added in the effective flood zones and flood risk areas. 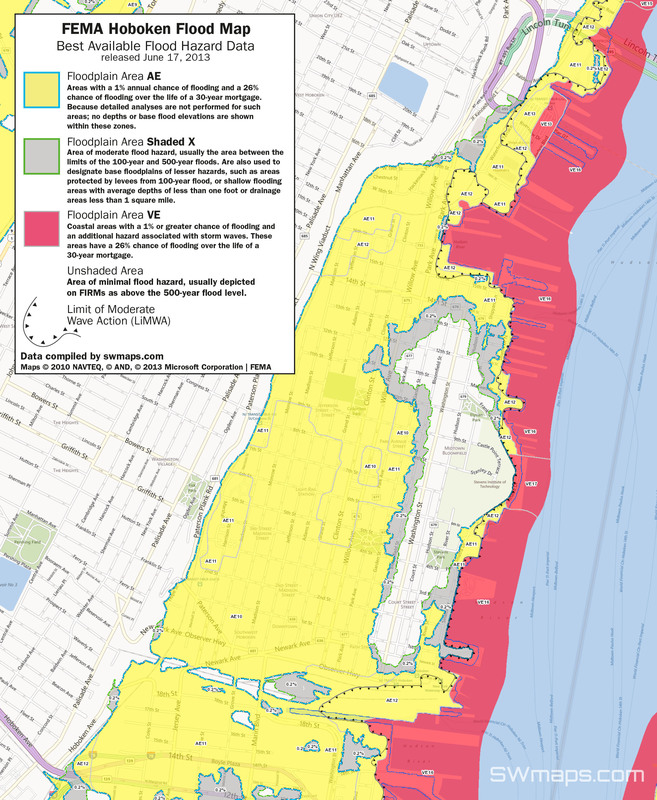 You can view their map by CLICKING HERE On this map you have the option of selecting different content layers to show the Effective Flood Zones from Sandy (Select the content option tab and check on: National Flood Hazard Layer (Sandy Area)). I’ve show this area on my own version of the map for comparison to the above maps. Click on the map to the right to see a larger version.